April 3 is the 93rd day of the year(94th in leap years) in the Gregorian calendar. 272 days remain until the end of the year. 686 – Maya king Yuknoom Yich'aak K'ahk' assumes the crown of Calakmul. 801 – King Louis the Pious captures Barcelona from the Moors after a siege of several months. 1043 – Edward the Confessor is crowned King of England. 1077 – The first Parliament of Friuli is created. 1559 – The Peace of Cateau-Cambrésis treaty is signed, ending the Italian Wars. 1834 – The generals in the Greek War of Independence stand trial for treason. 1860 – The first successful United States Pony Express run from St. Joseph, Missouri, to Sacramento, California, begins. 1865 – American Civil War: Union forces capture Richmond, Virginia, the capital of the Confederate States of America. 1882 – American Old West: Robert Ford kills Jesse James. 1885 – Gottlieb Daimler is granted a German patent for his engine design. 1888 – The first of eleven unsolved brutal murders of women committed in or near the impoverished Whitechapel district in the East End of London, occurs. 1895 – The trial in the libel case brought by Oscar Wilde begins, eventually resulting in his imprisonment on charges of homosexuality. 1933 – First flight over Mount Everest, by the British Houston-Mount Everest Flight Expedition, led by the Marquis of Clydesdale, and funded by Lucy, Lady Houston. 1936 – Bruno Richard Hauptmann is executed for the kidnapping and death of Charles Augustus Lindbergh, Jr., the baby son of pilot Charles Lindbergh. 1942 – World War II: Japanese forces begin an assault on the United States and Filipino troops on the Bataan Peninsula. 1946 – Japanese Lt. General Masaharu Homma is executed in the Philippines for leading the Bataan Death March. 1948 – Cold War: U.S. President Harry S. Truman signs the Marshall Plan, authorizing $5 billion in aid for 16 countries. 1948 – In Jeju Province, South Korea, a civil-war-like period of violence and human rights abuses begins, known as the Jeju uprising. 1955 – The American Civil Liberties Union announces it will defend Allen Ginsberg's book Howl against obscenity charges. 1956 – Hudsonville–Standale tornado: The western half of the Lower Peninsula of Michigan is struck by a deadly F5 tornado. 1968 – Martin Luther King Jr. delivers his "I've Been to the Mountaintop" speech. He was assassinated the next day. 1969 – Vietnam War: United States Secretary of Defense Melvin Laird announces that the United States will start to "Vietnamize" the war effort. 1973 – Martin Cooper of Motorola makes the first handheld mobile phone call to Joel S. Engel of Bell Labs. 1974 – The 1974 Super Outbreak occurs, the second biggest tornado outbreak in recorded history (after the 2011 Super Outbreak). The death toll is 315, with nearly 5,500 injured. 1975 – Bobby Fischer refuses to play in a chess match against Anatoly Karpov, giving Karpov the title of World Champion by default. 1981 – The Osborne 1, the first successful portable computer, is unveiled at the West Coast Computer Faire in San Francisco. 1996 – Suspected "Unabomber" Theodore Kaczynski is captured at his Montana cabin in the United States. 1997 – The Thalit massacre begins in Algeria; all but one of the 53 inhabitants of Thalit are killed by guerrillas. 2000 – United States v. Microsoft Corp. : Microsoft is ruled to have violated United States antitrust law by keeping "an oppressive thumb" on its competitors. 2004 – Islamic terrorists involved in the 2004 Madrid train bombings are trapped by the police in their apartment and kill themselves. 2007 – Conventional-Train World Speed Record: A French TGV train on the LGV Est high speed line sets an official new world speed record. 2008 – ATA Airlines, once one of the ten largest U.S. passenger airlines and largest charter airline, files for bankruptcy for the second time in five years and ceases all operations. 2008 – Texas law enforcement cordons off the FLDS's YFZ Ranch. Eventually 533 women and children will be taken into state custody. 2009 – Jiverly Antares Wong opens fire at the American Civic Association immigration center in Binghamton, New York, killing thirteen and wounding four before committing suicide. 2010 – Apple Inc. released the first generation iPad, a tablet computer. 2013 – More than 50 people die in floods resulting from record-breaking rainfall in La Plata and Buenos Aires, Argentina. 2016 – The Panama Papers, a leak of legal documents, reveals information on 214,488 offshore companies. 2017 – A bomb explodes in the St Petersburg metro system, killing 14 and injuring several more people. 2018 – YouTube headquarters shooting. Year 686 (DCLXXXVI) was a common year starting on Monday of the Julian calendar. The denomination 686 for this year has been used since the early medieval period, when the Anno Domini calendar era became the prevalent method in Europe for naming years. 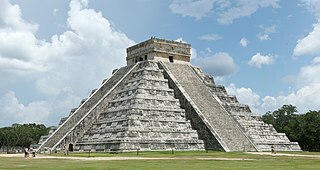 The Maya civilization was a Mesoamerican civilization developed by the Maya peoples, and noted for its logosyllabic script—the most sophisticated and highly developed writing system in pre-Columbian Americas—as well as for its art, architecture, mathematics, calendar, and astronomical system. The Maya civilization developed in an area that encompasses southeastern Mexico, all of Guatemala and Belize, and the western portions of Honduras and El Salvador. This region consists of the northern lowlands encompassing the Yucatán Peninsula, and the highlands of the Sierra Madre, running from the Mexican state of Chiapas, across southern Guatemala and onwards into El Salvador, and the southern lowlands of the Pacific littoral plain. Calakmul is a Maya archaeological site in the Mexican state of Campeche, deep in the jungles of the greater Petén Basin region. It is 35 kilometres (22 mi) from the Guatemalan border. Calakmul was one of the largest and most powerful ancient cities ever uncovered in the Maya lowlands. Year 1016 (MXVI) was a leap year starting on Sunday of the Julian calendar. Emperor Xingzong of Liao, personal name Zhigu, sinicised name Yelü Zongzhen, was the seventh emperor of the Khitan-led Liao dynasty. Year 1151 (MCLI) was a common year starting on Monday of the Julian calendar. Abu'l-Hasan Ali al-Adil ibn al-Sallar or al-Salar, usually known simply as Ibn al-Sal[l]ar, was a Fatimid commander and official, who served as the vizier of Caliph al-Zafir from 1149 to 1154. A capable and brave soldier, Ibn al-Sallar assumed senior gubernatorial positions, culminating in the governorship of Alexandria. From this position in 1149 he launched a revolt, along with his stepson Abbas ibn Abi al-Futuh. Defeating the army of the then vizier, Ibn Masal, he occupied Cairo and forced the young Caliph al-Zafir to appoint him vizier instead. A mutual disdain and hatred bound the two men thereafter, and the Caliph even conspired to have Ibn al-Sallar assassinated. During this tenure, Ibn al-Sallar restored order in the army and strove to halt Crusader attacks on Egypt, but with limited success. He was assassinated at the behest of his ambitious stepson Abbas, who succeeded him as vizier. SaintsAgape, Chionia, and Irene were three virgin sisters who, according to Christian tradition, were martyred for their faith in the year 304 AD. The story of their martyrdom is the subject of Dulcitius, a 10th-century medieval Latin drama by the secular canoness, Hrotsvitha of Gandersheim, the first known female playwright. Their feast day is April 3. Saint Luigi Scrosoppi was an Italian priest of the Roman Catholic Church who founded the Sisters of Providence of Saint Cajetan of Thiene. He was canonized in 2001. Richard of Chichester, also known as Richard de Wych, is a saint who was Bishop of Chichester. November 10 is the 314th day of the year in the Gregorian calendar. 51 days remain until the end of the year. 1 2 Champagne, Duane (2001). The Native North American Almanac. Farmington Hills, MI: Gale Group. ISBN 0787616559. ↑ Berger, Joseph. "Dina Abramowicz, 90, Librarian and Yiddish Expert, Dies" . Retrieved 2018-10-17. Wikimedia Commons has media related to April 3 .